Background: MicroRNAs (miRNA) are a class of non-coding single-strand small RNAs and play important roles against abiotic stress. High temperature is one of the major adversities that plants suffered during their growth and development. Objective: The research here was intended to profile the miRNAs in creeping bentgrass to characterize the possible heat resistance mechanisms. Method: Normal and 42℃ high temperature treated for bentgrass were handled by High-throughput small RNA sequencing. We found the known and novel miRNAs and predicted their target genes, using RT-qPCR to confirm the sequencing result. Results: High-throughput small RNA sequencing results showed 182 conserved miRNA sequences of 42 miRNA families and 10 novel miRNAs in creeping bentgrass leaf samples mostly in length of 20 and 21 nucleotides. 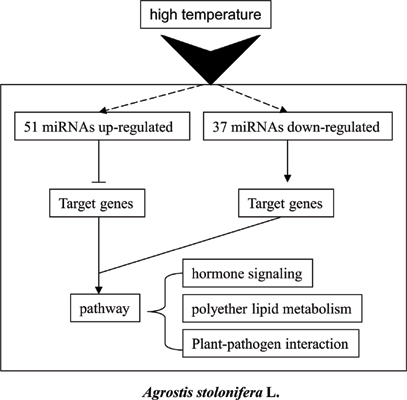 Bioinformatics analysis indicated that 84 conserved and 4 novel miRNAs were either up- (51) or down (37) regulated by heat, respectively. Gene Ontology enrichment and Kyoto Encyclopedia of Genes and Genomes pathway analysis of the miRNAs&apos; target genes indicated that they were mostly involved in plant hormone signal transduction, plant-pathogen interaction and polyether lipid metabolism. 15 randomly selected heat-responsive miRNAs were examined through real-time quantitative PCR and showed fluctuating expression patterns during heat treatment. Conclusion: The present study successfully gains insight into the gene regulation network to high temperature stress mediated by miRNAs and provides its significant value for stress oriented genetic engineering. Agrostis stolonifera L, high temperature stress, miRNA, real-time PCR, target gene.